An important decision when choosing the proper cutting head for waterjet cutting is the configuration of the orifice, the most common being the sapphire and the diamond orifice. Of course, the different gemstones have different characteristics. Dealing with the different orifice types, it may strike the attentive observer that diamond orifices are considerably more expensive than sapphire orifices. The question here is whether the higher quality of the gemstone and consequently of the orifice can justify the price premium. The bottom line is that every machine operator has to decide that on their own; however, the diamond does have some key advantages over the sapphire. First of all, the lifetime of a diamond orifice is on average 25 times longer than that of a sapphire orifice. This of course means that the latter has already been exchanged 25 times before the former shows any signs of wear at all. Besides this mere amount of orifices, the quicker wear of the sapphire still has some further consequences: The first effects of wear may become visible after only a few hours of operation. This results in the cutting jet exiting the orifice less directed and losing its exact focus – facts which impair the cutting performance. As the diamond lasts considerably longer, the waterjet is optimally directed and focused for a longer time and the operator achieves a better cutting performace. Moreover, it is not imperative to directly exchange a diamond orifice when the performance decreases; very often, a simple cleaning of the stone in an ultrasonic bath is enough to once again ensure an optimal focusing of the jet. Additionally, a jet which is accurately focused for a longer time increases the lifetime of the focusing tubes. So which kinds of users should consider choosing the more expensive diamond orifice? To begin with, it is important to know that sapphire orifices cannot be used at extremely high pressure around 6,000 bar. Yet even at a lower pressure range, machine operators should not take into account the initial costs alone. As soon as an orifice has to be exchanged, the machine is on hold or the respective cutting head is switched off. 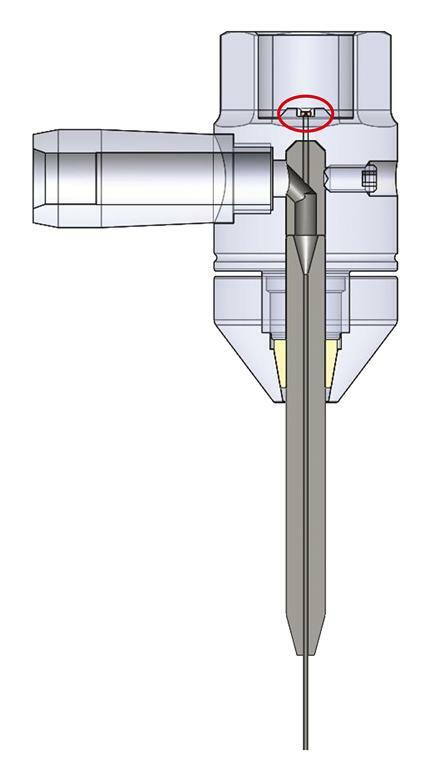 So if more than one cutting head is in use on one machine, the productivity of the complete system can be increased by employing high-grade diamond orifices: If, for example, eight cutting heads work in parallel of which one has to be switched off due to orifice wear, the output of the worn-out head is missing in the total production. However, also when using just a single head, a diamond orifice often is the better choice, particularly when the cutting process is a long and continuous one. In such a case, fast wear and thus the necessity for frequent orifice changes can reduce the productivity of the complete process. Considering the sapphire orifice, its use may be a valid choice for those waterjet cutting machines which operate with only a single head and which only carry out short cutting processes as is often the case in pure water cutting. If a system, due to the expected workload, is frequently on hold anyway, the time necessary for exchanging the orifice is not of such a big consequence. Who does not know the situation when a newly acquired technical device or a machine does not work like it should do or even stops working at all after a short while due to defective components? Without a doubt, such a situation is inconvenient and becomes even more so the longer the exchange of the defective parts takes due to ambiguous warranty conditions. Thanks to comprehensive quality testing and high quality products, KMT Waterjet Systems can eliminate such incidents to a very large extent. Unfortunately though, there may be individual cases of defects. These should of course be resolved as quick and easy as possible. Therefore, KMT has transparent and well-structured warranty conditions which guarantee a quick and hassle-free handling of all warranty cases. KMT Waterjet Systems provides their customers with a clear-cut guideline concerning these issues. For about a year now, the company has been successfully using a classification system which unambiguously categorizes all components of the high pressure pumps for waterjet cutting machines. For the implementation of this system, KMT has thoroughly examined the individual components and classified them into three different categories. There are consumables such as seals, check valves, etc., which are not covered by the warranty, as well as wear parts (high pressure cylinder, seal head, plunger, etc.) 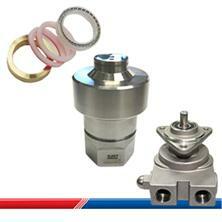 and spare parts (electric motor, hydraulic pump, etc. ), which have clearly defined warranty periods and conditions depending on the pressure range of the respective pump type. Therefore, there is a clear transparency for KMT customers when acquiring a new high pressure pump as the warranty conditions are unambiguous for each and every component. The purpose of this system is to give the company’s customers the certainty that they are always on the safe side with original KMT products. The warranty conditions can be requested at info@kmt-waterjet.com or at the phone no. +49-6032-997-0.